This is a great book, full of animals, instruments, rhymes and fun. 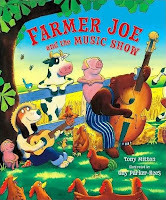 It is the story of Old Farmer Joe, a hound dog whose hens just won't lay eggs. So he starts playing music for them, and soon as more friends hear the music and join, the whole farm is rocking out to a hillbilly sound. This book is an oversized picture book with incredible illustrations, and magical rhymes that bring the animals together. Your young children will love and enjoy it again and again.